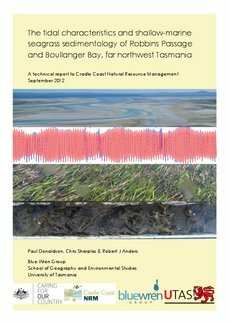 This natural resource management research project was initiated by the Cradle Coast NRM, in response to the knowledge gaps identified by the Blue Wren Group in understanding elements of Robbins Passage-Boullanger Bay (RP-BB) coastal processes. • Investigate the carbon sequestration potential and palaeo-environmental evolution of RP-BB shallow seagrass beds, based on a set of shallow marine sediment cores. • RP-BB Posidonia australis dominated subtidal seagrass meadows are highly effective at sequestering carbon.